The arts are not just under attack in Britain. 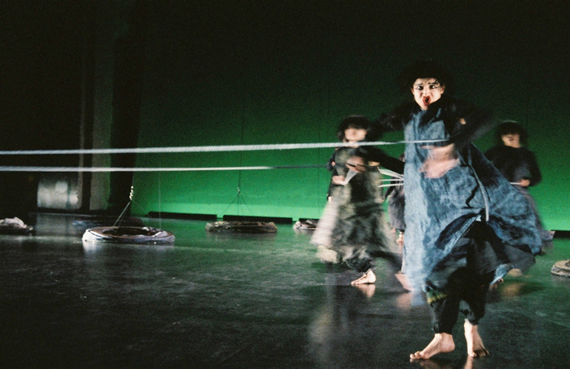 Creating unique cutting-edge visual theatre in Vienna for 35 years, self-financed and with complete artistic control, the Serapions Theatre company's existence now hangs in the balance. Co-founder and artistic director Edwin Piplits talks to Dylan Strain about Serapions’ work and the city authority’s threat to the company. He's a warm man in his 50s, is Viennese-born Erwin Piplits, immaculately dressed in dark neutral colours, thick round black specs and slicked back grey hair. The look is artistic and down to earth. We talk in a big uncluttered office at Odeon, Serapions Theatre space, in the old corn exchange, a beautiful building outside, even more so inside. The name derives from E.T.A. Hoffmann, (1776-1822) the German romantic writer, who created with his brother the “Serapions Principle” - never tell anything you don't know. This is a founding principle of the group's work. "So it's what we would call Wahrhaftigkeit." He ponders for a while, then consults his colleague in the next office - "truthfulness". Piplits is engaging and he's keen for me to clearly understand Serapions’ philosophy. Before 1973 he was a sculptor. Now his sculptures are his clearly beloved multi-national ensemble of eight (from Korea, Cuba, Brazil, Colombia, only one an Austrian) who move, dance, sing (and very occasionally speak) in front of the audience. Unlike most theatre, where a company would find a play to perform, then cast the actors, Piplits and co-partner Ulrike Kaufmann find actors they want to work with and start to improvise and devise from there. No experience as an actor is strictly necessary, Piplits told me about a time he hired a Scottish chap, who he liked. "He replied to our advert, he had humour, charisma. But it is very hard work in our productions. You must be extremely fit. Many actors have trouble working with us. It is different to what they are used to, but those that have, have gone on to be quite famous." They take a text, often a classic piece of literature, which has naturally come to mind, being born out of the previous show. "Do you know it?" he asks of each classic work. "No," I reply, to ever increasing embarrassment. Thankfully he's fine with each little let down, treating me with no less respect. They then create a new, essentially “mute” work over a three-and-a-half month rehearsal period. They improvise for the first month, "then set the show to perfection over the rest of the time, hopefully never to change for 125 performances". He explains: "After 25 performances there is a danger of routine. But after that it's like learning a new instrument; you repeat and repeat and after a time it becomes a part of you. We must be careful nothing changes. We must not lose the spiritual. Many people see the show at its beginning, they come back after 100 performances and say 'It's changed a lot’ but it hasn't changed. It's just become richer, deeper, more a part of the performer." They have produced a play by German playwright Tankred Dorst. He gave them his play "and we only took ten sentences from it, he liked it, it was true to the text, but just a new dimension", Piplits explains. 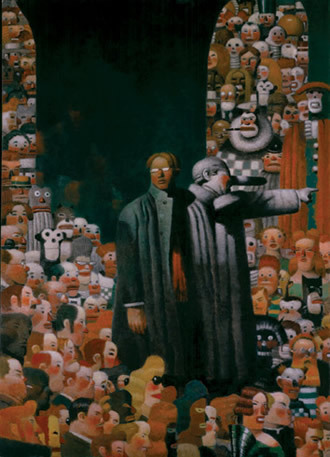 Despite the approach of using one text as the main inspiration and an additional couple of texts to feed in and perhaps use minimally as text spoken, each show over the 35 years boils down to being fundamentally, at root, about the same thing: "How to learn to be a human being." Piplits says of the show Com di Com Com: "In the beginning they come, jump out of the fountain, innocent, go through hell, a very dangerous place, dogs coughing (barking) around you, wolves howling, you feel without power, you're not free, not connected to others - angry, if you are angry, you're a loser, you must be stronger, you need to step out of this custom, take a step. There is disharmony, the music is like that, strong, powerful and slowly becomes more harmonic as they discover freedom, you can't be free alone, only free to work together." He suddenly changes tack. "The audience is not guided by us, they have their own free view, you come to it with your own background." The company are able to hire out the theatre space to raise revenue to keep going, despite only able to rent their home. A group of architects hired the space recently and one man asked the other, "What is a Serapions show like? He didn't say, he simply said; ‘Go in like a child and you'll come out like a child, with a sense of astonishment.’" Piplits adds: "And to be astonished is the first step of thinking. Things will happen to you didn't expect. But I tell you too much, I'll spoil it, I don't like to tell too much normally!" The show is universal. No matter what your background, religion, age or culture. It's a spectacle, with the merit of a David Hare or Tom Stoppard play. But the intellect should be switched off for Piplit's shows. A dance and movement piece essentially, the cast studied Yoruba African dance and kung fu for this show. The lights, music and sounds were specifically, painstakingly added, a quite brilliant mix of music from around the world chosen and mixed by Piplits. The Korean song is sung live. It's operatic, soulful, moving. The surprises are there, the show ever changing, progressing. 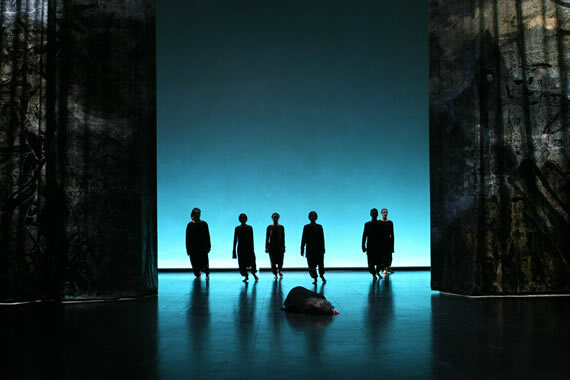 The set is simple but the vision of ideas are impressive, the painted backdrop suddenly setting off on a journey, all around the stage, suggesting the people on it are walking, travelling to a new place. Tubular drapes suddenly surprising, leaving the floor, rising to the ceiling, high in the air; or a circular solitary pool of light trapping the performers within. We the audience leave the theatre after the people have come together in the dance. They are genuinely joyful on stage; we, the crowd, joyful off it. Piplits remarks: “Nobody can tell us what to do. And this doesn't fit in our time. The city plans an unfriendly take over. It reminds me of dark times in the last century. In the last 15 years I've seen the bureaucratic dictatorship growing, at an extremely fast rate in the last five years. The crushing of art is in process, in the whole of Europe. They want to tell us what to play here and who should be in charge. Mrs Thatcher has not been here!" 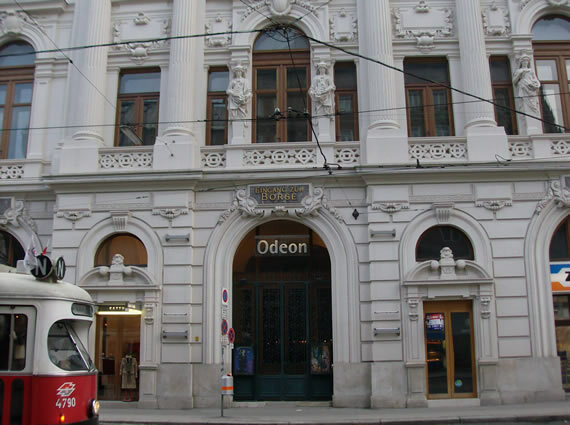 If they lose the corn exchange building, they'll lose the 2 million euros they've invested in renting the space over the last 20 years. "We earn 86% of our revenue from the box office." He tells me: "I don’t have much reason, but we are hopeful of keeping it." His colleague comes in, reminding him he has to be somewhere else. Before going, he gives me a huge book, a great gift, documenting each show in the first 30 years of Serapions Theatre. He walks down to the box office with me. I try to pay for my ticket, help the cause and all, but he won't have any of that. Sometime later, after the show in that beautiful hall outside the theatre, he catches my eye from 20 yards. "Did you see?," projecting his voice, smiling. I did, and hopefully many, many more will continue to see for another 35 years. 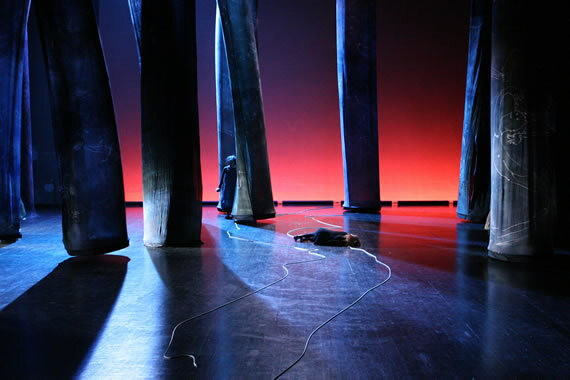 The next production at Odeon, Taborstrasse 10, Vienna will be Alcyone, an opera by M. Marais, directed by Philipp Harnoncourt from 12 March, 2008. Website.